Let`s have a great Party at the “Radio Arabella Disco Night” on Saturday 9th of February. 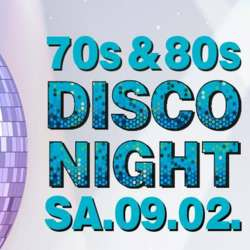 Dance & Party to the greatest hits of the 70ies und 80ies - from Abba to Zappa! Disco is Alive! The Arabella DJ "Wetterhuber" & DJ Daddy Cool will mix up the greatest Disco, Flower Power, Rock & Pop Hits of the 70ies und 80ies! Please note. You will pay the reduced entrance fee only if you are on the guest list, otherwise you will have to pay the regular entrance fee. The deal with the reduced entrance fee is valid only till 23:00.